Yesterday we spent the entire day in Florence. Every once in a while, we have so many things that need to be done, it just takes all day. There’s no way around it. So we dedicated Monday from 6 am to 7 pm to make everything happen. Yes, we said 6 am—as in the morning. But we’re happy to report that we not only made a clean sweep of it, but enjoyed an extra surprise along the way. Little did we know that our burger day had finally arrived! When we decided to move to Italy years ago, we wanted to create a totally unique and diverse experience, which means we had to leave all (well, maybe not all) of our US habits behind. Our plan was to try our level best to immerse ourselves in the Italian culture. So we eliminated any and all fast food. (Not that we were “regulars” at the drive through, by any means.) So, among other things, that meant no HAMBURGERS. And up until Monday, we’d enjoyed about 12 years without even a twinge of desire or regret. That changed yesterday when we sat down for lunch at one of our favorite restaurants—da Que’ Ganzi. 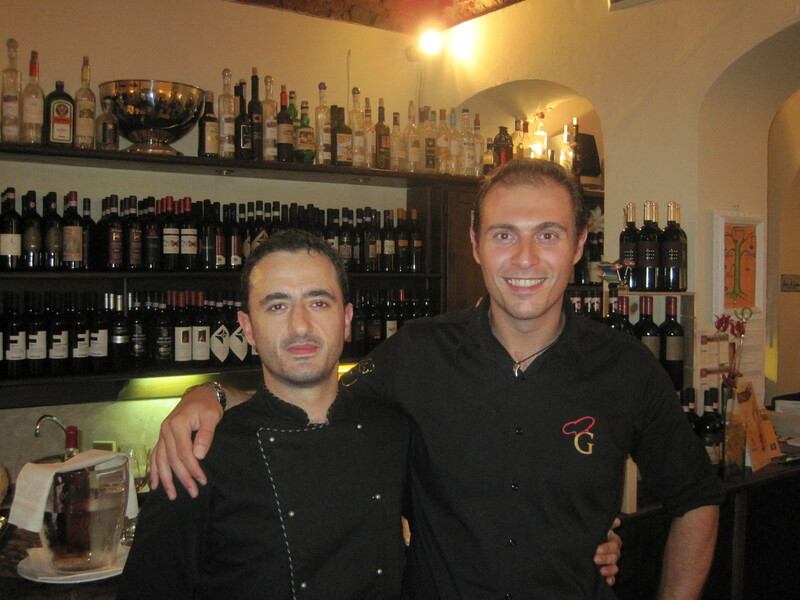 The owners Domenico and Matteo are always doing something different, which we really like, and that day was no exception. When Domenico handed us the day’s menu with a few extra special treats on it, I had to chuckle when I read the news of their latest creation: hamburger and fries. I immediately called out to Domenico in disbelief: Che cos’è questo—what’s this? Che fate—what are you guys doing? Now those were serious questions for anyone as proud as they are of their authentic Cucina Toscana, Tuscan Kitchen. We all laughed and joked about it for a few minutes, and then he replied in all seriousness. 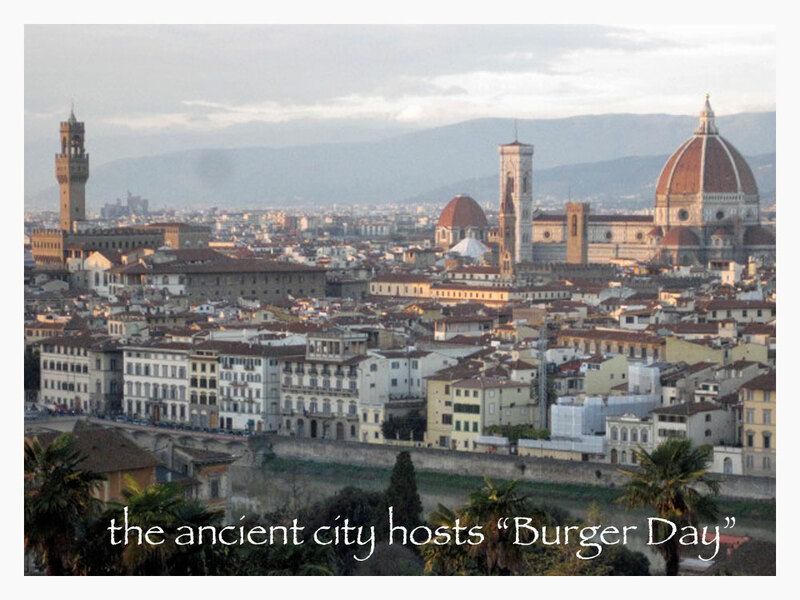 Domenico explained that the “hamburger” was actually ground by Matteo right there in their own kitchen, from the incredible Bistecca Fiorentina, the famous local T-bone steak. In addition, it’s grilled to perfection by Matteo in the tradition of all good Tuscan meats—sangue, rare. And the accompanying fries are really patate fritte, fried potatoes, which are a far cry from any regular old French Fries. Then, in true Italian style, he added, “È buonissimo, it’s delicious!” What he really meant was, “You’d have to be some kind of fool not to try this!” Well, I’m a fairly easy mark for a persuasive Italian, and I buckled like a cheap elastic belt. Immediately I said without blinking an eye, “Perché no, why not?” In literally seconds, and without remorse, I sacrificed our unblemished 12-year record of no burgers. I must admit that I was pleasantly surprised when Domenico delivered my burger without the benefit of a bun. It seemed more classy and appropriately Italian. Needless to say, it was the best burger and fries I’ve ever had, and that includes some pretty tough challengers: White Castle, In-N-Out Burger, Jug Burgers from Middletown Ohio, or even the greasy delights from the Sangy Wagon of my college days. Of course, there wasn’t any real competition because we all know that the quality of a meal has as much to do with the company you keep, and the mood you create, as it does with the food itself. But let’s face it—I’m talking about sitting across the table from sweet Cheryl, enjoying the ambiance of the ancient brick vaults overhead, listening to the laughter and lyrical language of Domenico, while chowing-down on some of the best food in the world, prepared especially for us by Matteo in their own personal kitchen just meters away. No contest! 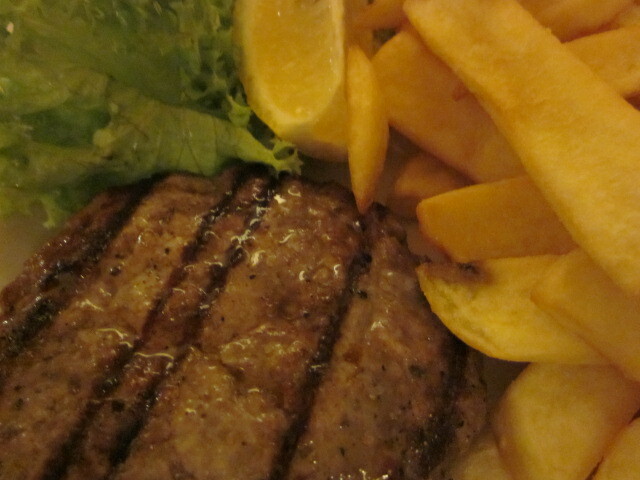 That was officially my one and only hamburger with fries in Italy. I admit that it was truly delicious. But I also know, that it could never get any better than that, so I’ve decided to quit while I’m ahead. That is . . . unless it becomes a new Tuscan tradition, in which case I would have to keep my promise and fully immerse myself in it. One of the best cheeseburgers I ever had was at the Rialto Hotel’s outside restaurant in Venice. We were travelers ready for American food, and it far exceeded expectations.